We are on a serious budget these holidays, but it doesn’t mean I don’t want to get out and about with my kids. For starters, the more time I am out of the house, the less time Lorelei has to trash it. I hate housework, and this toddler of mine demolishes the house daily. So a day spent somewhere else, is a good day. Also, Madeleine has been on school holidays since the first week of December, so she is already starting to get bored. Hehe – see this post for other “free boredom busters” for your tweens/teens. I’ve been proactive and scoured the Internet and my local newspapers for free and cheap things to do with the kids these school holidays. I’ve put together a calendar for the date specific events, and a general list of idea’s for the other days when it seems good to get out. We won’t do everything on this list, but at least if the stars align and I want to get out, the idea’s are already there and there is nothing to stop us. We can be like good like Zhu Zhu pets and "GO GO GO!" Check your local council, as well as surrounding council websites. They are a great place to start as they usually list both their own events and activities as well as are happy to provide links and details to other community groups. Check your local newspaper. You know that little free one that gets dropped off each week? There is always an events section in there are well, near the classified usually. Also pay attention to the ads, there might be vouchers for local attractions. Check your local clubs (RSL, Leagues, Workers, etc) websites. Often there are shows aimed towards kids with ticket prices that are very reasonable. We’ve found disco’s, family fun days, and great performances at some of our clubs. Facebook pages! A quick visit to the facebook page of a local attraction (pools, clubs, gyms, animal farms etc) can sometimes yield open days, or free times to visit. Shopadocket. Sometimes there are some good vouchers on the back – get 2 kids in for the price of 1 etc or adults at kids prices. Check your local shopping centre – there are often shows on during the school holidays that the kids will enjoy. Check the daily deals websites! After we lined up our desired activity list for the holidays, there were a few things we were happy to pay for if we could get a good price. After checking all of the daily deals sites (Groupon, Scoopon, Spreets, Livingsocial etc) we actually found a few of them on special and were able to buy tickets at half price. I also snagged a $5 all day Sydney CBD parking voucher, which will make our Darling Harbour day out much more affordable. If you are prepared with this information NOW at the beginning of the school holidays, you are in the best position to take advantage of the free or cheap opportunities. Sometimes the activities I find might only take up an hour, but with a packed lunch and a trip to the park afterwards, we've had a great morning at no cost, and then the kids settle happily at home. Here’s my school holiday calendar. 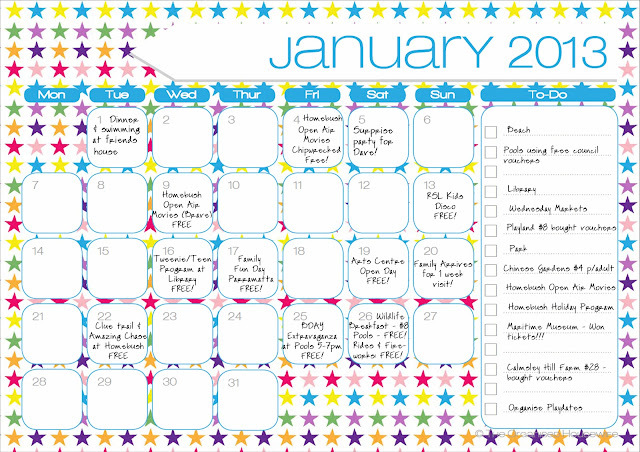 You can find this seriously awesome, FREE downloadable year round calendar in a few different designs over at the talented Organised Housewife. If you aren't already reading her blog you are missing out on some great stuff. As you can see, not all the days are filled in, but we have so many idea's and other things to do on my To-Do list that if we don't feel like staying at home, a day will be easily filled. Are you prepared to beat the boredom these school holidays? Have you lined up some awesome stuff? Share in the comments with your state so that others can benefit!! Oh wow, that is fabulous organization!! What a great idea Elise! We're on a serious budget here as well so finding free activities for the kids takes a bit of the pressure off. I hope the stars align for you multiples times during these holidays so you can get to do some fun and free things with your girls! I think I might even have scheduled way too much for us, which feels great. Better too much than too little! You're super organised. We're lucky with the theme parks all nearby and yearly passes there's always somewhere to go or something to do. Oooh, jealous. We managed x2 trips to QLD in the first half of the year using yearly passes, and had the best time. We finally have a Wet n Wild opening up in Syndey sometime soon and we can't wait. Super organized! I'm sure your kids won't b bored these hols!